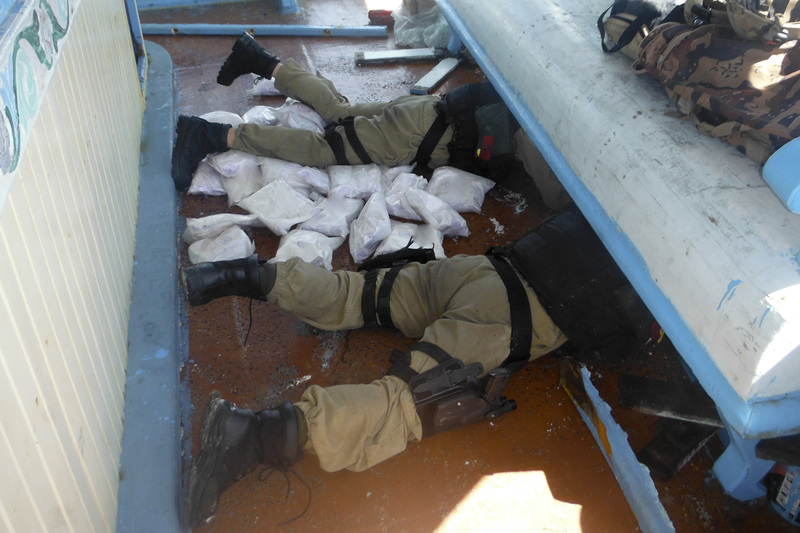 A warship attached to the Combined Maritime Forces (CMF) has made its second major drugs bust in six weeks, seizing over 300kgs of heroin. The Canadian frigate HMCS Toronto intercepted a suspect dhow 118 miles of the coast of Tanzania, having tracked her for several days before finally swooping in to make the boarding. Once on board, Toronto’s crew discovered the drugs hidden underneath a fake rail in the dhow’s stern. 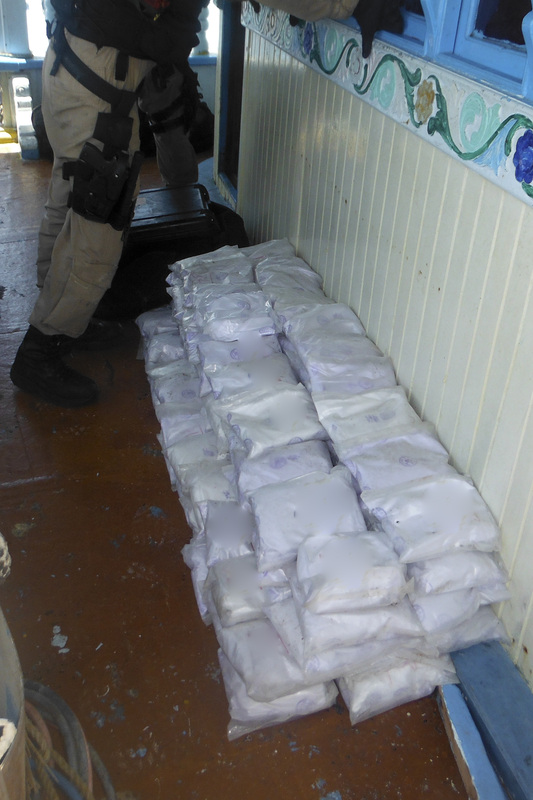 After an extensive search, a total of 317kgs of processed heroin was recovered, along with a small amount of hashish. All the seized drugs have been destroyed. The success marks Toronto’s second major haul since her deployment to the Middle East began earlier this year, coming hot on the heels of a seizure of 500kgs of heroin from a similar vessel on 29 March. 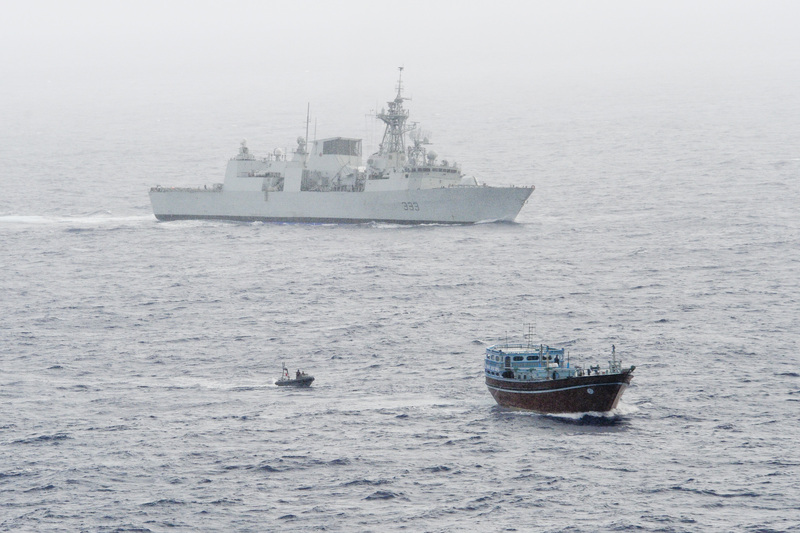 Toronto’s Commanding Officer, Commander Jeff Hamilton, said: “The success of this operation marks another significant maritime interception of narcotics in the Combined Maritime Forces area of operations. Operating under the direction of the French-led Combined Task Force (CTF) 150, Toronto has been patrolling the waters of the Indian Ocean, Gulf of Aden and Red Sea promoting maritime security and stability in the region. Captain Jean-Michel Martinet, Commander of CTF 150, said: “This important seizure of drugs, represents another step toward ensuring a secure maritime environment for legitimate mariners in the region and Toronto can be very proud of her achievement. CTF150 forms part of the multinational CMF, which draws together assets and expertise from 28 nationsto coordinate maritime security operations across the Middle East. The CMF mission is to promote security, stability and prosperity across the Arabian Gulf, the Gulf of Oman, the Red Sea and the Indian Ocean. The area encompasses approximately 2.5million square miles of international waters, including some of the world’s most important shipping lanes. The smuggling of narcotics in the Northern Indian Ocean and surrounding region is a recognised funding source for terrorist organisations. By interrupting the narcotics trade CTF150 is able to deny financial resources to extremist groups. Commodore Simon Ancona, Royal Navy, Deputy Commander of CMF, said: “To make a second haul of this magnitude is an impressive achievement, and my wholehearted congratulations go out to HMCS Toronto, her crew, and CTF 150.